The weather forecast for the 2nd January was not good. Only four hardy souls were keen to venture out and up. 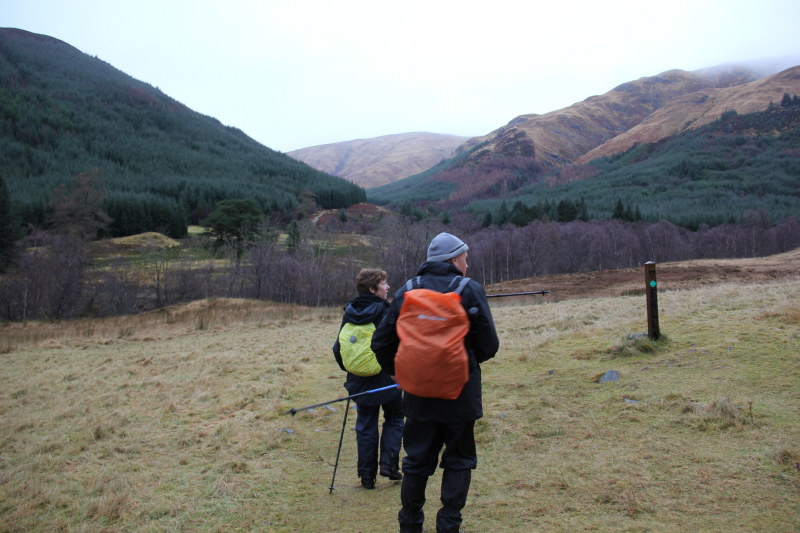 Shona and Des were keen to visit the Falls of Glomach while Graeme and I were keen to ascend Carnan Cruithneachd. Graeme and I opted to approach Carnan Cruithneachd from the South-East, allowing both groups to walk together as far as the Bealach na Sroine. 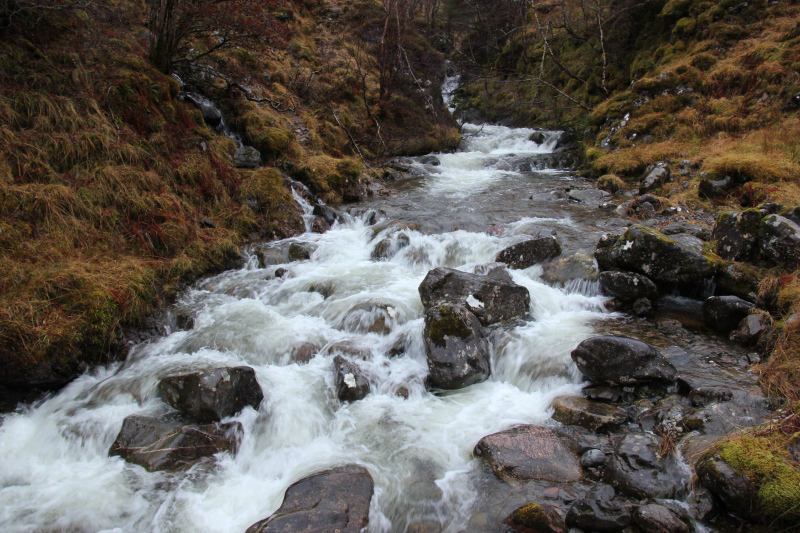 The temperature had been really mild during the night resulting in significant snowmelt and spate conditions. 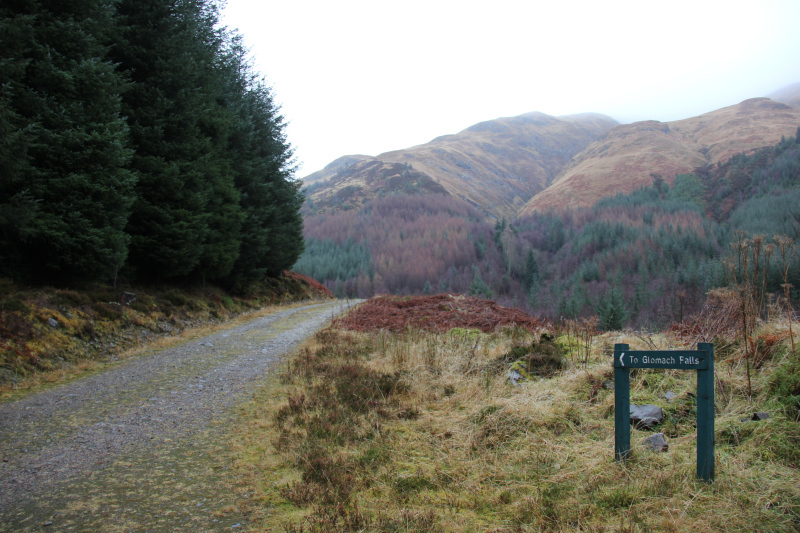 We progressed along Gleann Choinneachain, as per the day previous, but this time turned off at the path junction signposted for the Falls of Glomach. 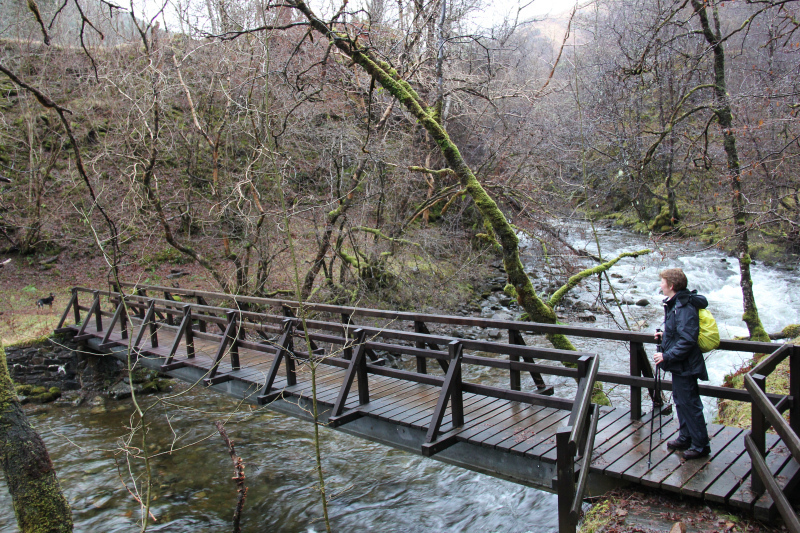 A short distance beyond the path junction, we crossed the bridge over the Abhainn Chonaig. 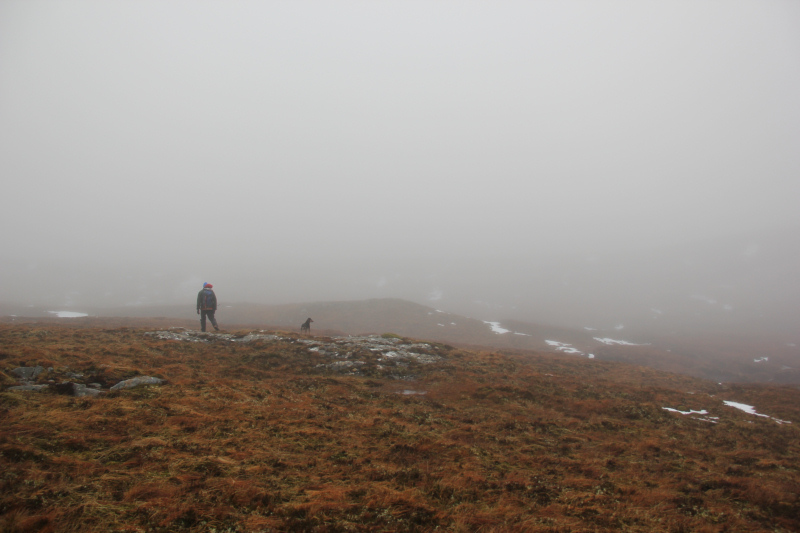 After passing the kennels, at the other side of the Abhainn Chonaig, we started our ascent of the wide track heading towards Bealach na Sroine. Walking along this track brought back some good memories of exactly one year previous when I ascended A’Ghlas-bheinn on 2nd January 2012. 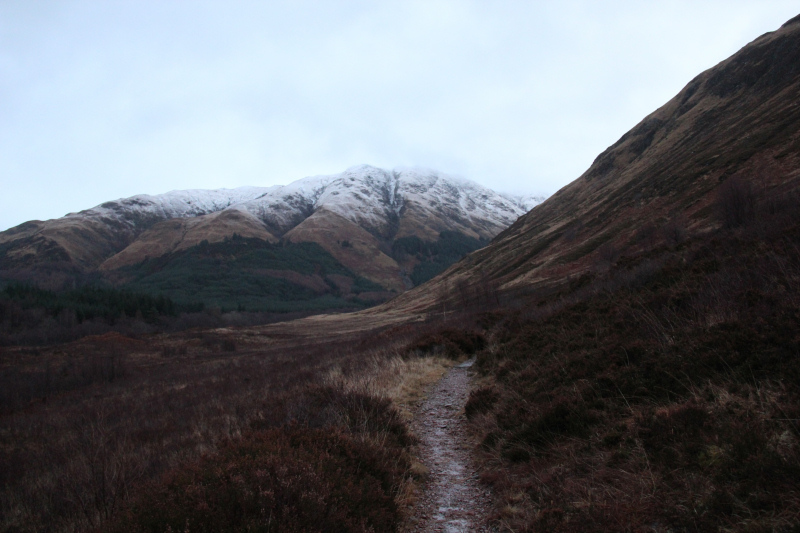 I recalled the snowball fight on this track – no snow today though! 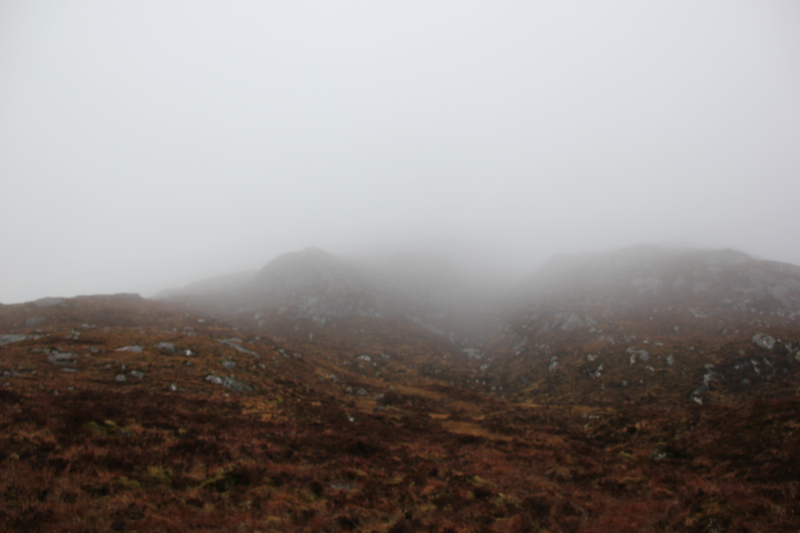 Once across the bridge over the Allt an Leoid Ghaineamhaich we followed a path up the hillside to the Bealach na Sroine. At the bealach we parted company as Shona and Des continued on along the track to the Falls of Glomach while Graeme, PennyTWD and I ascended Carnan Cruithneachd. 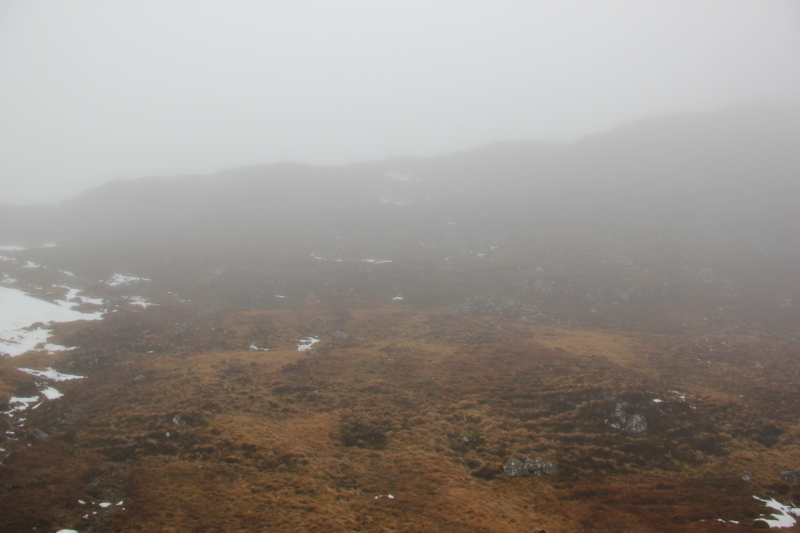 Views were non-existent as we walked in the clag. It was also very wet underfoot. 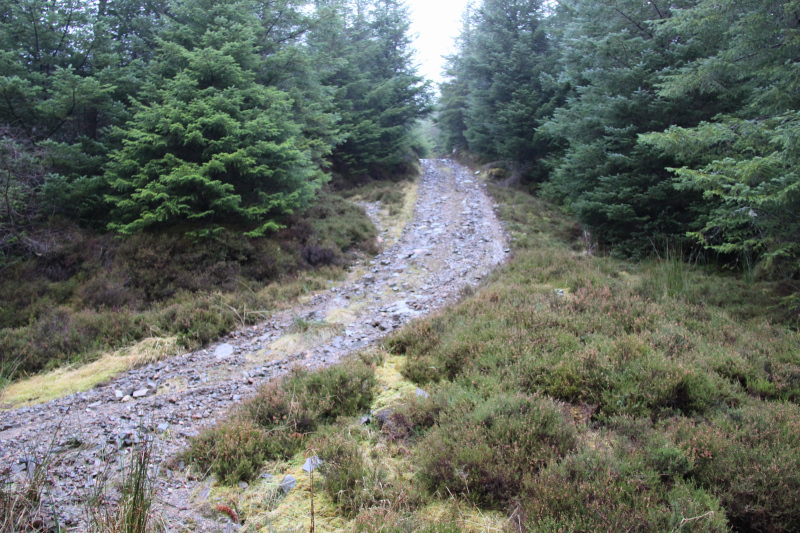 The final section up to the summit was fairly steep. I had to put hands to rock in a couple of places to continue up. I used Viewranger to confirm the location of the summit. It was very windy up top. 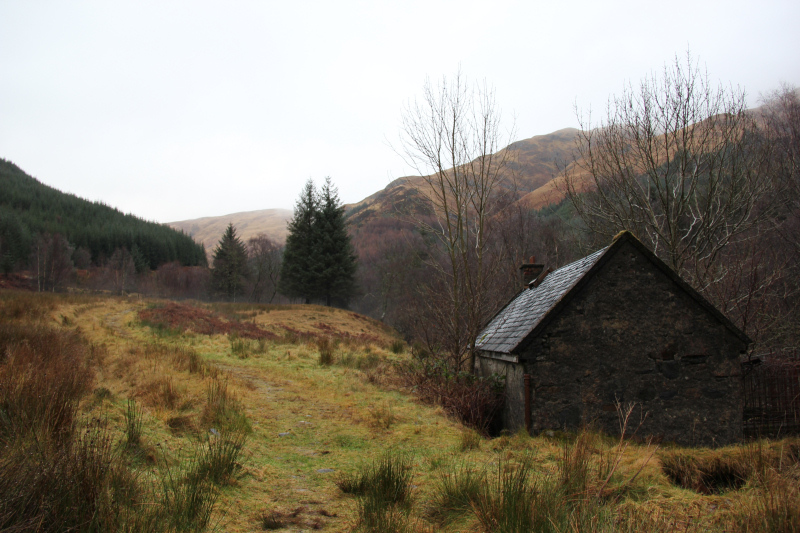 Graeme had read Dempster’s route for this Graham and so suggested a circuit of the hill descending to the West. The descent was fairly steep. 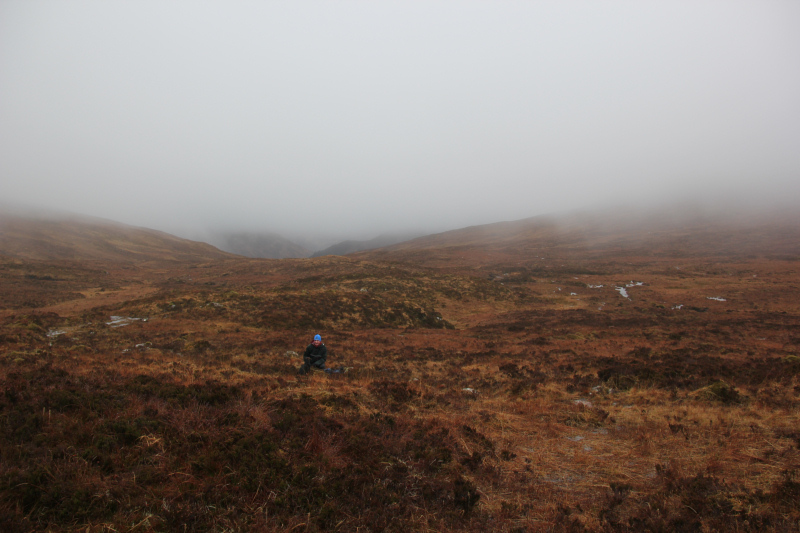 We used numerous grassy sections to avoid the outcrops but did not encounter any difficulties. In the mist, it looked worse than it actually was. On reaching the path to the West of Carnan Cruithneachd we stopped for a bite to eat. 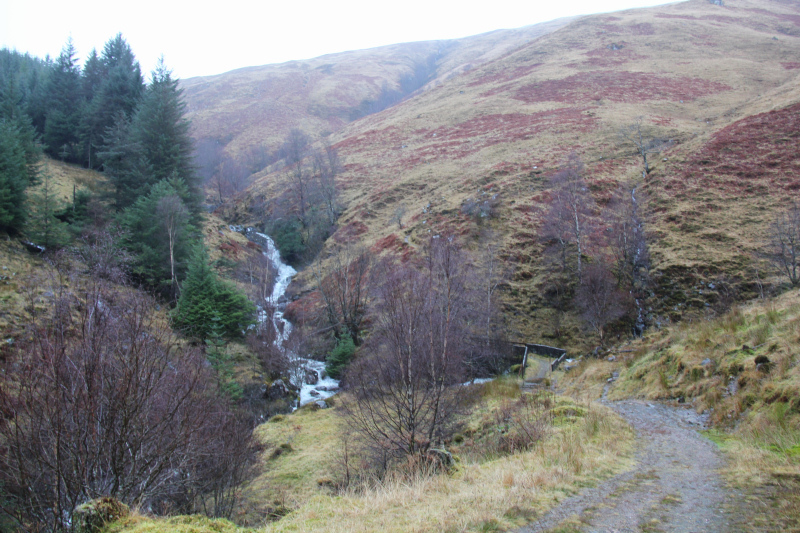 We then followed the path for a couple of kilometres to eventually reach the Falls of Glomach track that we had used earlier in the day. 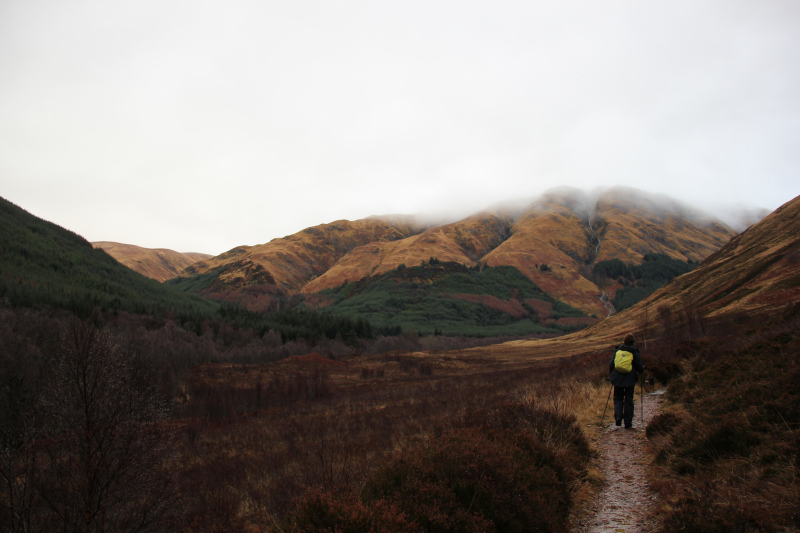 From the Falls of Glomach track, we continued back to Morvich via our inbound route. 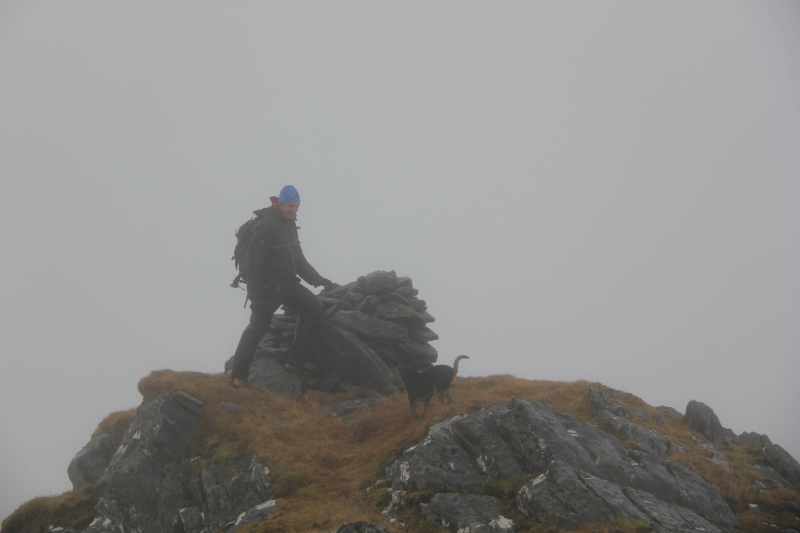 Disappointing visibility and conditions but a walk undertaken in good company. Shona and Des also enjoyed their visit to the Falls of Glomach. The video footage of which looked awesome in the spate conditions.